Samburu and Buffalo Springs National Reserves offer unique vistas of rounded and rugged hills and undulating plains. The mix of wood and grassland with riverine forest and swamp is home to a wide variety of animal and bird life. The Ewaso Ng’iro River has a healthy crocodile population and hippos. It’s also a major draw for wildlife, especially the numerous elephant families that cavort and play in the shallow waters. The bird life is superb with over 380-recorded species. Game includes reticulated giraffes, grevy's zebras, elephants, oryx, Somali ostrich, hippos, crocodiles, gerenuk, buffaloes, lions, leopards, cheetahs and hyenas. Shaba National Reserve is home to Joy Adamson's Monument. It is notable for its hot springs. Samburu and Buffalo Springs, in particular, are popular tourist routes. 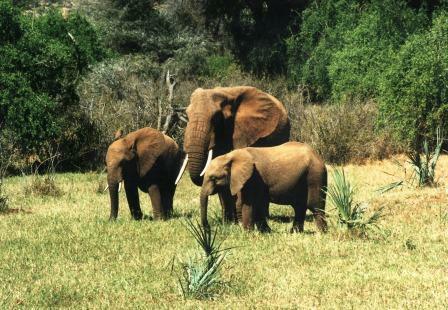 Maralal and Laikipia Game Sanctuaries are also located in this area and can be visited by arrangement. Laikipia Plateau Reserve was opened in October 1991. It is northeast of Laikipia District, and borders Isiolo District. To the west is the Mkogodo Forest Reserve, a belt of riverine forests along the Ngare Ndare River. It is the home of a small unique ethnic group known as the Laikipia Maasai. The landscape is rich and varied. 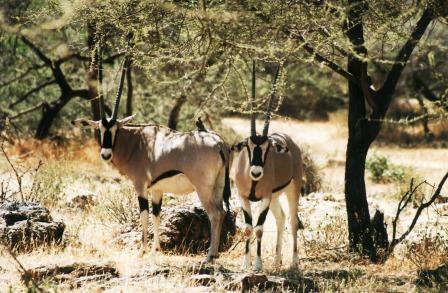 There are elephants, elands, buffaloes, grevy's zebras, bushbucks, and cats (cheetah, leopard and lion). It is good for bird watching. It is a little known area, which is ideal for the intrepid traveler.